Airport worker Erik Johnson will be mourned at the corner where he lost his life in 2013 by a family still wondering why the death did not lead to change. Johnson was crossing Rockaway Boulevard at Farmers Boulevard (arrow). Erik Johnson died two days before Thanksgiving in 2013. 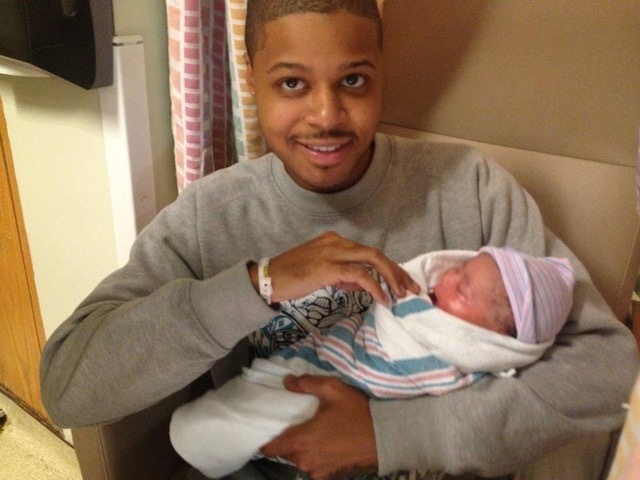 City DOT has not fixed the intersection of Rockaway and Farmers boulevards in Springfield Gardens, where two days before Thanksgiving 2013, Erik Johnson stepped off a bus just before sunrise and was hit before he could even get halfway through the nine-lane intersection. “The impact was so hard that he flew. And he flew out of his pants, apparently,” said his sister Ericka Johnson. The driver who hit Johnson was not charged. Police accounts blamed the 24-year-old for his death, with a police spokesman saying that Johnson may have stepped into the path of the Subaru as he crossed Rockaway Boulevard from the north along the west side of Farmers. A police source told Streetsblog at the time that there was no indication Johnson was in a crosswalk — of course leaving out the detail that there was no crosswalk for him to use. “They said the driver wasn’t speeding. They took his word for it — that it was an accident. They basically blamed it on Erik,” his sister said. 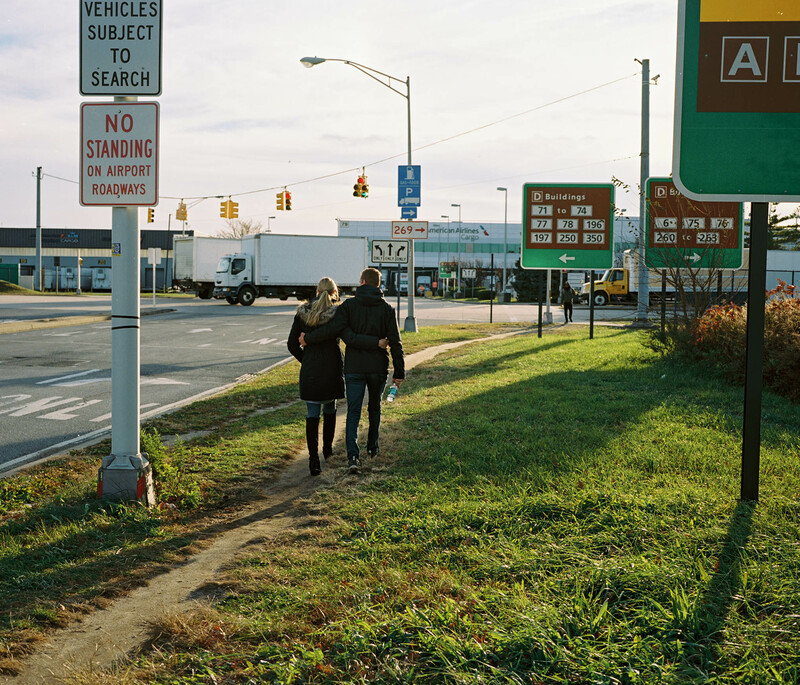 Two people walk towards John F. Kennedy International Airport, along a dirt path that shows the need for pedestrian infrastructure. Photo: Liam Quigley. The city knows the intersection is dangerous — in fact, it was dubbed a “high-crash location” in a 2016 DOT study on the area. Yet no pedestrian safety improvements have been made — even the speed limit remains higher than the citywide limit of 25 mph. The driver who killed Johnson had been coming off a stretch of the Nassau Expressway where the limit is 50 mph. The speed limit on the other side of the intersection is 30 mph. A small sign alerting drivers to the lower speed limit is more than 300 feet down the road from where Johnson was hit. When Streetsblog asked DOT why the intersection has not been improved, an agency spokeswoman said officials do not believe there are very many pedestrians there — though a DOT borough commissioner contradicted that at a public hearing, according to a final report on the traffic study [PDF — page 10-3]. “Borough Commissioner said that there are a large number of pedestrian crossings at the intersection of Farmers Boulevard and Rockaway Blvd. due to the existence of a daycare facility,” the minutes state. People on their way to work at the airport consistently expressed concern with the intersection when interviewed for this story. “I almost got hit out here one time. We need a sidewalk out here,” said Neil Blake, a China Airlines cargo worker who crosses Rockaway Boulevard five days a week. Blake is one of over 15,000 people employed in the air cargo industry at Kennedy, according to a state report. The governor’s new $13-billion dollar plan for Kennedy Airport renovations will rely on the labor of those like Erik Johnson, but their safety is barely an afterthought. “It just makes it feel like, the lives of people don’t matter,” Ericka Johnson said. “And his death doesn’t matter. Because if it did matter, something would have been done about that area. It’s a death trap,” she said. Erik Johnson’s family will gather at Rockaway Boulevard and Farmers Boulevard on Nov. 26 at 6:19 a.m., as they have done each year since his death. This is sad. Prayers go out to the Johnson family. Typical of cops finding fault in pedestrians and giving drivers (even when they are obviously at fault) a get out of jail free card. All of Rockaway Blvd out to the Nassau County border is a death trap for pedestrians as well as anyone foolish (brave?) enough to risk cycling on that high-speed roadway. Drivers routinely exceed 60 mph. A sidewalk, overgrown with weeds and in poor condition, exists on only one side; there’s not even a footpath on the other, JFK side. 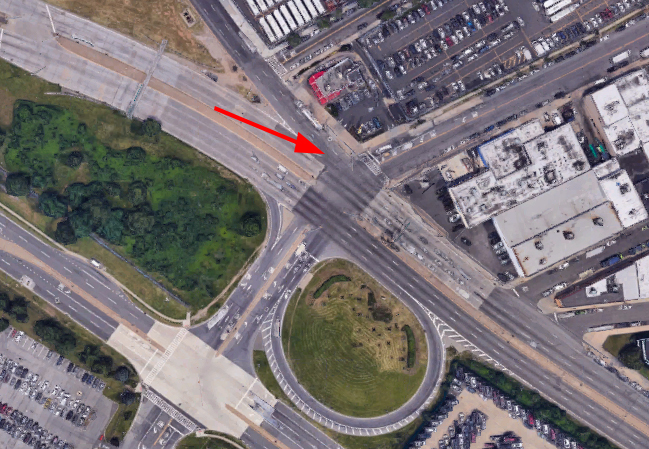 This could be a useful link for cyclists heading to/from Far Rockway or Long Beach, but it’s sheerly suicidal now. I have ridden out to Nassau on Rockaway Boulevard several times. I avoid the intersection of Rockaway Boulevard and Farmers Boulevard, which is barely navigable by bike, due to the interaction with the Nassau Expressway. I turn left off of Rockaway at 147th Avenue, then continue to where that street hits Farmers Boulevard. Then I make a right at Farmers, and a quick left to go south on 175th Street, so as to rejoin Rockaway Boulevard. The DOT’s response here reminds me of those UESiders who oppose cycling infrastructure for various stated reasons, but usually with the implicit understanding that cycling infrastructure will draw more cyclists to and through the neighborhood. The idea is, keep it unsafe for those cyclists who do choose to risk it, so as to discourage others from coming through. Low pedestrian traffic should never be the explanation for why pedestrian infrastructure is not needed. It’s a self-reinforcing rationale. The DOT should, instead, look at local land use and what pedestrians are doing, if they’re not crossing at a particular intersection. There is also a large homeless family shelter 1/4 mile from this spot along Rockaway Blvd. Just an awful, auto-dominated area. The crash is reminiscent of the Thanksgiving 2013 death of Erik Johnson along a similar highway-like stretch.